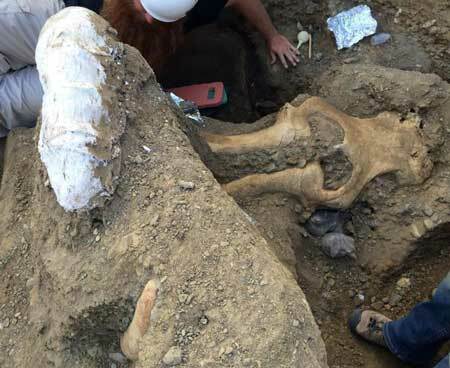 On an island just off the coast of Ventura County, scientists say they have discovered the remains of an “unusual” mammoth that lived alongside some of the earliest known human inhabitants of Southern California. The fossil was found in a stream bank on Santa Rosa Island in Channel Islands National Park, which is also the site of the discovery of Arlington Man, the oldest set of human remains yet known in North America. “This mammoth find is extremely rare and of high scientific importance,” said paleontologist Justin Wilkins in a press statement. “It appears to have been on the Channel Islands at the nearly same time as humans. Part of what’s perplexing about this specimen, however, is that it’s not clear exactly what kind of mammoth it is. But the Channel Islands have also produced many fossils of pygmy mammoths — animals that were substantially smaller, a mere 2 meters tall at the shoulder, after living for eons in evolutionary isolation. The newly found mammoth appears to be too large to be a pygmy, but is not large enough to be an adult Columbian, the experts said. And equally confusing is the growth of its tusks, they added. The right tusk is 1.4 meters (about 4 feet 7 inches) long and is tightly curved, a sign of a fully grown mammoth. But the left tusk is much shorter and features more of a “slope” than a coiled curve, which is indicative of a juvenile. Whether the specimen is a young Columbian mammoth or some mid-sized species that’s new to science might become more clear when researchers are able to study its teeth. The layers of enamel within the teeth allow scientists to track the mammoth’s growth to within two years, they said. But for now, the most useful clue researchers have to work with is a deposit of charcoal that was found near the skull. This helps researchers understand the environment that the weird mammal lived in, but it doesn’t yet help them understand where the specimen fits within the surprisingly long and complex history of mammoths in the Channel Islands. In 2013, geologist Dan Muhs with the U.S. Geological Survey discovered the tusk of a pygmy mammoth eroding out of a pillar of rock on Santa Rosa that was dated to 80,000 years ago. So Muhs believes that mammoths first arrived in the Channel Islands as much as 150,000 years ago, when sea levels were substantially lower and many of the islands were a single land mass whose shores were closer to the mainland. 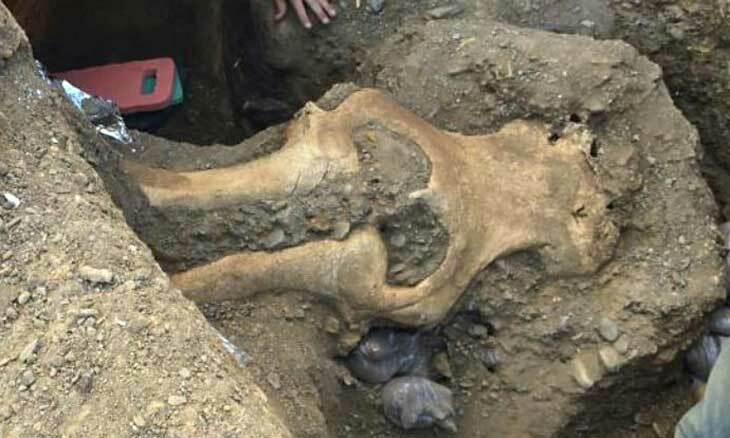 But since the newly found mammoth is clearly not a pygmy, this suggests that there must have been a second, more recent wave of mammoth migration to the island, Muhs said. 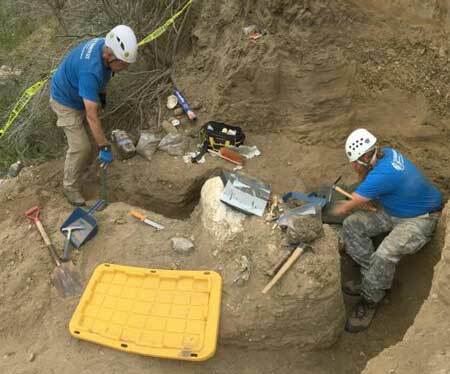 Once field researchers have finished excavating the skull, it will be taken by helicopter, and then boat, and finally by truck to the Santa Barbara Museum of Natural History, where it will be prepared and investigated. “One of the purposes of the park is to provide scientific value,” Channel Islands National Park Superintendent Russell Galipeau pointed out in the press statement. It is worth noting that the oldest date on human remains in the Americas comes from the Witt site in the Southern San Joaquin Valley in California. That date is a Uranium-Thorium date and is estimated at very nearly 16,000 years. It was mistakenly published recently as being RCYBP. However, Uranium series dates are a direct measurement of the ratio of a parent isotope and a daughter isotope. As such it is simple calendar years. The piece was mistakenly collected as a fossil mammal bone by a private collector and was willed to the state. The sample was dated along with other megafauna from the site and two other fragments of human bone. These dates unambiguously place humans in North America by 16,000 BP. They swam, elephants swim and the Channel Islands were one big island and was closer to shore 13,000 years ago.